Record Company – Warner Bros. - Seven Arts Records, Inc. Published By – Joint Music Co., Inc. Published By – Yameta Co. Ltd.
First Pressing with Warner 7Arts/Reprise 'disc' logo. Orange/Yellow two-tone labels. All compositions published by Bella Godiva Music with the exceptions of "Little Miss Strange", Joint Music; "Burning of the Midnight Lamp", Yameta Co., Ltd.; and "All Along the Watchtower", Dwarf Music. Recorded at The Record Plant, New York. Reprise Records, a division of Warner Bros.-Seven Arts Records, Inc.
my Electric Ladyland record 2 has two 'side C' labels. Anyone else have this double 'C' labeled disc ? I'm wondering if I can get some help. I THINK I have a first-pressing Reprise version of this record. The labels on the record are orange and yellow, it is made in the USA, the catalog # is 2 RS 6307, and immediately below that number it has (30, 802) in parenthesis. It is a gatefold, with photos surrounding a long horizontal rectangle that has the title and artist of the record as well as "letter to the room full of mirrors," "help from our friends and passengers includes:", anda few other things. My father insists that is a first-pressing W7 Reprise, but I'm not sure. By 1968 I'd seen Hendrix perform. An act that surpassed Arthur Brown for vaudeville and virtuosity. 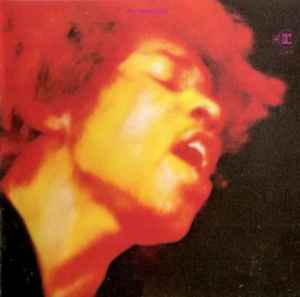 I dashed out and bought 'Electric Ladyland' on day one. But, I still wasn't prepared. I had the other two albums, but this was music from the other side of the cosmos, played inside-out by all my blues guitar heros rolled into one. Inspired, astounding, awesome and other adjectives too numerous to mention. 'All Along The Watchtower' is the diamond among the gems, an 'arrangement' stamped with Hendrix style and heaped with praise by its author Dylan. Progressively comparable only, in my book, to Frank Zappa- a methodic yang to Hendrix's untamed yin. On first hearing him Zappa thought he was good, but too loud. Later, Hendrix gave FZ his burned-out strat. A surprising move for a guy who even took his guitar to the toilet to keep practicing. There was respect, although FZ showed no sentimentality and had the defunct axe rebuilt. When Hendrix & Kramer released the Record Plant master tapes of 'Electric Ladyland' to Reprise, a first-generation copy was also despatched to Track/Polydor in the UK. Aware that the 'swirling & phasing' present on the recording would give concern to the metal mastering engineers, a warning was attached that the engineers should not attempt to reduce the effects and that they were intentional. Bearing in mind this was 1968 and the 'cosmic' & 'spatial' effects on the recording were likely in advance of anything the engineers were used to hearing. The request was duly followed by Polydor's engineers, who were perhaps more in tune with this 'new wave' of music, but ignored by those at Reprise who were probably more at home with Sinatra. First UK pressings (613008/9 and beyond) are bright and fresh, the US pressings (2RS 6307) are flat by comparison. Early UK issues, with auto-coupled discs and the variants of the blue text or rotated inner spread, are rarities. Those in possession of the album with the Karl Ferris 'red and yellow head' image of Hendrix might be interested to know it was taken during the first show at the Saville Theatre in London on 27 August 1967. The 2nd show was cancelled on news of Brian Epstein's death. He was the proprietor of the theater. Over the years remastered versions of 'Electric Ladyland' have appeared, created from US 2nd generation or transfer tapes (the original tapes being the subject of legal wrangles & finally coming to rest with Experience Hendrix LLC). There's been remastering and quasi-mono issues by Lee Herschberg and a remaster by Joe Glaswirt, with Dave Mitson assisting, using the Sonic Solutions 'NoNoise' system. However, it's not until Experience Hendrix made their releases on both CD and limited edition vinyl that a significant competition to the original UK pressing arrived.